They may have won the last round in Sydney, but Canada and their inspirational player Jen Kish are not about to rest on their laurels in Las Vegas as they seek to create a piece of history. Jen Kish was back where she loves to be in Sydney, wearing the Canadian national jersey with “complete joy” and playing an inspirational role once more as her side claimed the inaugural HSBC Sydney Sevens crown with victory over surprise finalists the USA. Kish admits she has “never been a good spectator” as she had to be when injury ruled her out of the opening round of the HSBC World Rugby Women’s Sevens Series 2016-17, but that doesn’t mean she doesn’t see her absence in a positive light. “I’ve never been a good spectator, especially when I am watching my team play. Sometimes watching leaves me feeling helpless, nervous and a bit envious,” admitted Kish ahead of her 20th series event this weekend in Las Vegas. “However, there are some positives to spectating. I get a bird’s eye view of the game of sevens, which helps me become a better student of the game and it also gives another player in our programme a shot to compete on the world stage. “It’s always an incredible honour for me to put the jersey on and the feeling that comes with it is complete joy. There are 24 of us in the programme, who are very skilled, so to be selected as one of the 12 players to compete in Sydney was a special moment for me. The Olympic bronze medal Kish and her team-mates secured at Rio 2016 has also left its mark on the country. Kish is perfectly suited to sevens and loves every aspect of the game. 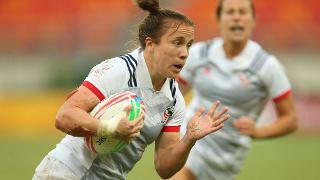 “I love that sevens is a fast-pace game that exposes even the best defenders in the world. It also shines a light on the best attackers in the world. When you get the best against the best, you get a game that is hard to look away from. “I love that there are a lot of one on one battles that happen in the game. In particular, for me, the restarts – I love flying through the air, putting my body on the line just so I can win the ball back for my team and see our best attackers take on some of the world’s best defenders. It would be easy to cite the return of Kish as a key factor in Canada turning a sixth-place finish in Dubai into their third series event win in Sydney, but while her influence is unequivocal for Kish it was a “12-player effort” that was the difference. Canada will face France, Russia and invitational side Argentina in Pool A at the Sam Boyd Stadium on Friday, but Kish is taking nothing for granted as her side aim to win back-to-back tournaments for the first time on the series. “We have played France and Russia many times,” admitted Kish. “They are two teams that have the potential to beat anyone if they are on form. Even though we have more wins over both teams, we do not overlook them. They both have world-class attackers and defenders. “If we want to come out on top, which is what we are expecting, we will only be able to do that if we are on form ourselves. Argentina is not a team we have seen much of but sometimes it’s those teams who can be most dangerous. “It will be important for us to stay in structure which can be difficult when you play a team who does the opposite. It may seem like we have an ‘easy’ pool but what pool has ever been easy for any team with the way the level of play has been rising in our game today? Somewhat worryingly for Canada’s opponents, Kish believes there is still plenty more to come from her team in what will be a busy few years with RWC Sevens, the Commonwealth Games and Tokyo 2020 Olympic Games as well as the series. “We have shown moments of brilliance but are capable of more than just these ‘moments’. “The level of the game keeps rising and we are always trying to be a level above that. When we do that consistently, win every tournament on the series, lose no games, then I would say you have seen the best of the Canadian women’s team. “Even if we were to win the series in the end, until we hit that perfect stat of no losses we will keep striving to be the number one team in the world with a record that some might see as unattainable but still very possible! Who do you think will come out on top in Las Vegas? Join the conversation @WorldRugby7s now.